Games encourage children to interact. In doing so, they help develop social and emotional skills. The Manadoob Secret Connection Game is a fun, creative interactive, community building experience. Modeled after the Manadoob Program for Self- Esteem, the Manadoob Game experience brings together kids, parents, teachers, health professionals, caregivers, grandparents … who role play, act out charades, problem solve, face their fears and help others believe in themselves. You can even adopt a pet along the way. The Manadoob Secret Connection therapeutic game educates, empowers and stimulates emotional growth and maturity in children. By focusing on values such as responsibility, patience, trust, courage and gratitude, the Manadoob Game teaches children to make positive choices and work together to solve problems, which helps to create happiness and success in their own lives and in our world. 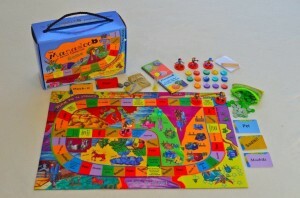 The Manadoob Secret Connection Game is for 2 to 6 players ages 7 and over.